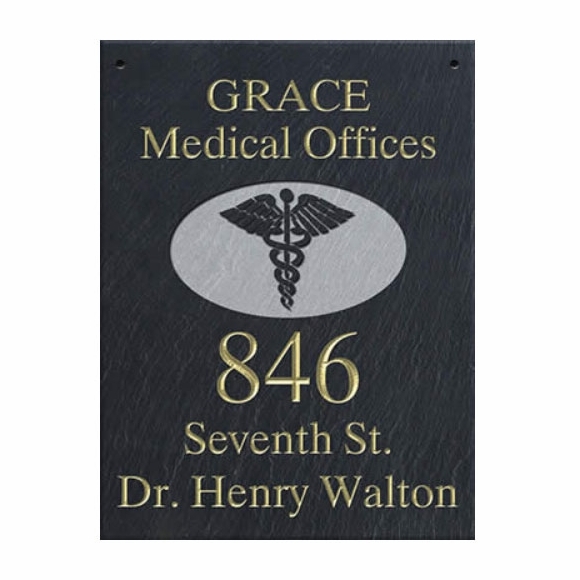 Doctor's Office Address Sign - - personalized 12" x 16" hanging slate plaque contains five lines of text to identify and advertise your medical office and a prominent two-snake caduceus logo. Made in USA. There's plenty of room for the office or practice name, specialty, your own name, street address, phone number, or any other pertinent information you want to display. Line 1 holds up to 12 characters approximately 2" high. Line 3 holds up to 5 characters approximately 2.5" high. Line 5 holds up to 15 characters 1" high. Hang on a post close to the road so that patients and prospective patients can easily find your office . . . especially good on rural roads, busy shopping streets, and office parks. The hanging address sign also comes in an oversized version (see Related Products).